Do you have a question about EverBlock? Browse the below list of frequently asked questions. Click the question to go directly to the answer. If you do not see an answer to your question email us at sales@everblocksystems.com. ◙ What Is EverBlock Systems? ◙ What Are The Benefits of Using EverBlock? ◙ How Big Are The Blocks? ◙ How Stable Is An EverBlock Wall? ◙ Can I Include A Door Or Shelving? ◙ Can I Have A Swinging Door? ◙ Who Is The Brains Behind EverBlock? ◙ Where Is EverBlock Manufactured? ◙ How Are The Shipments Sent? ◙ Do You Ship Internationally? ◙ What Colors Do The Blocks Come In? ◙ How Much Do The Blocks Cost? Any Discounts? ◙ Are The Blocks Soundproof? ◙ Have The Blocks Gone Through A Fire Test? ◙ Can I Build A House With EverBlock? ◙ Does EverBlock Offer Roofing? ◙ Are The Blocks Waterproof? 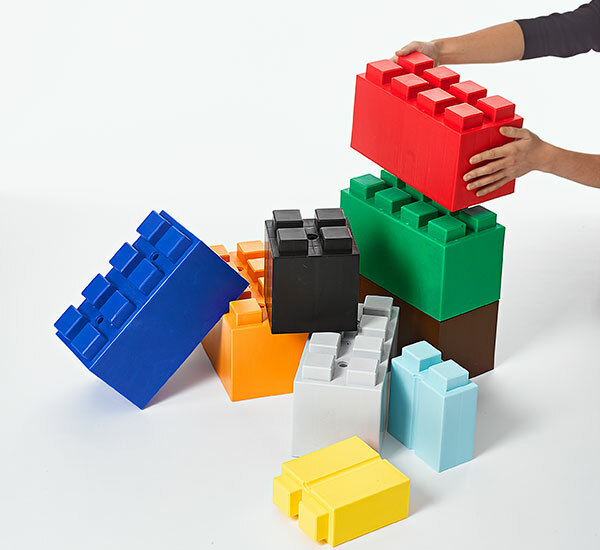 EverBlock is a modular building block system that allows you to build nearly anything. Through the use of interconnecting blocks, users are able to stack and stagger blocks to create all types of shapes and structures. With EverBlock, one can build walls, partitions, room dividers, modular furniture, office cubicles, booths and displays, catering bars and risers, tent walls, event decor, podiums, backdrops, illuminated structures and so much more. What are the benefits of using EverBlock? Having a modular system like EverBlock allows for tremendous flexibility. No tools, contractors or extra building materials are required. Our blocks are designed to be used over and over again to create all sorts of unique and fun structures and objects. Moving from your home or office? Simply break down your EverBlock room divider or furniture and bring it with you to your new location. Need to use EverBlock for another application? Simply reconfigure your blocks into whatever you may need. EverBlock has unlimited uses and lifelong value. Full Block: 12"L x 6"W x 6"H (+1" for lugs) 2.3 lbs. Line Block: 12"L x 3"W x 6"H (+1" for lugs) 1.12 lbs. Half Block: 6"L x 6"W x 6"H (+1" for lugs) 1.0 lbs. Quarter Block: 3"L x 6"W x 6"H (+1" for lugs) 0.5 lbs. Single Lug Block: 3"L x 3"W x 6"H (+1" for lugs) .24 lbs. Finishing Cap: 12"L x 6"W x 1.1"H / 0.25 lbs. Quarter Cap: 3"L x 6"W x 1.25"H / .10 lbs. Yes! EverBlock is covered by several USA and international patents covering both its block design and its shelving and desk system. EverBlock is NOT affiliated with The Lego Corporation, though we are big fans of their products. EverBlock is dimensionally and structurally very different from Legos both in size and in the ratio of length to width to height. 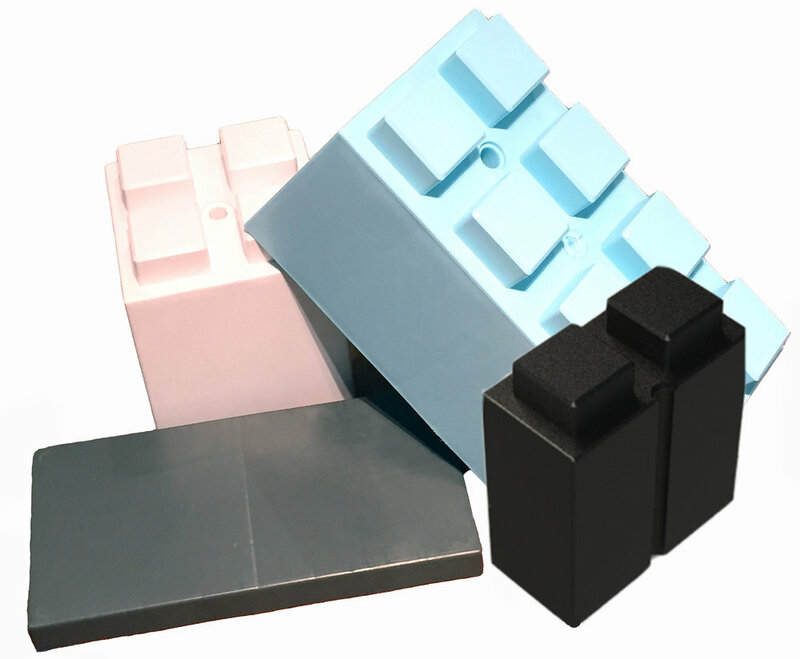 Besides for the obvious size and shape differences, EverBlock’s have a unique square lug-locking feature which hold the blocks together. The undercarriage of each block is designed for durability and weight loading and contains structural cross ribbing, which also serve as receivers for the square connector lugs. In addition to these big differences, our blocks have their own unique color choices and incorporate cable channels to run wires, cords, and lights. The original Legos block patent expired in 1989 with the others expiring over the years. EverBlock is used and loved in a multitude of industries; special events and trade shows, interior design and architecture (for modular furniture, room dividers and walls), modular exhibits and retail displays, modular buildings, gardening borders, decor, props and scenery, team building and educational STEM learning. EverBlock’s enthusiasts are those who think outside of the ‘block’. The uses of EverBlock are limited only by the imagination. Where To Begin If I Need A Design Build Of EverBlock? How Stable Is An EverBlock Wall? EverBlock’s are very easy to use, build and design with. When building walls we recommend building in a "brick lay" or “staggered” block pattern. In this way the blocks are reinforced from below and above and connected instead of being stacked directly on top of the other. We also recommend adding columns in the form of “L’s” or “T’s” to each side of a wall, for additional support. In walls longer than 5ft. we recommend adding a middle column as well. What Are The Blocks Made Of? The blocks are made of a high impact polypropylene plastic with color additives. Each block is also outfitted with UV inhibitors to protect the color and material if used outdoors. EverBlock meets all standards for material safety for both children and adults. Can I Include A Door Or Shelving? 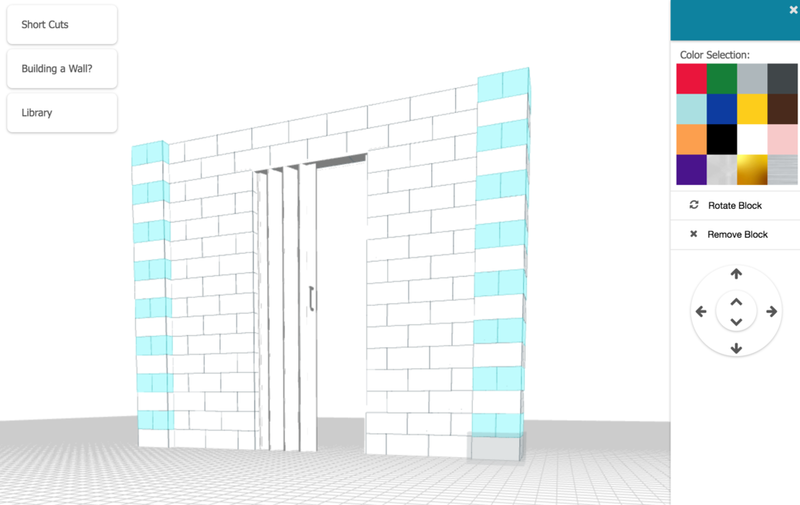 Yes, EverBlock offers an accordion door system which works seamlessly with the blocks. The shelving units are metal and can hold up to 200 pounds. There are also several shelving type units available in varying sizes. If you want to insert your own door, window, or accessory, we recommend reinforcing the area around the object with columns and framing out the area as you would a traditional door or window. You can screw right into EverBlock using standard sheetrock screws. Can I Hang A Swinging Door? It is possible to attach an aftermarket accordion door by fastening the track to our 48" Lintel Piece, creating a 36" doorway. Alternatively, we have had customers use a local contractor to frame out a door, as they would a traditional door and the install the door in the framing. This requires reinforcement of the blocks surrounding the door. Who Is The Brains Behind EverBlock? The EverBlock concept was created by Founder and CEO, Arnon Rosan. Prior to EverBlock Systems, Mr. Rosan founded and operated Signature Systems Group - the world’s largest manufacturer of modular plastic flooring, fencing and roadway systems for all types of events, retail, military, construction, industrial and specialty operations. EverBlock is proudly manufactured 100% in the USA, in Bronx, New York. How Are The Shipments Sent? Blocks are either shipped in large UPS boxes or on pallet, depending on what is most efficient. EverBlock has a warehouse in Bronx, NY and we ship throughout the USA. In addition, EverBlock has Agents who operate throughout the world and have inventory that they can ship to within each respective region. What Colors Do The Blocks Come In? Premium colors Gold and Silver are available. Custom colors are available by request, subject to minimum orders and lead times. How Much Do The Blocks Cost? Any Discounts? Educational discount are available for qualified educational institutions. We also offer discounted Bulk and Combo Packs. EverBlock’s have surprisingly strong sound dampening qualities, better than most standard temporary walls. Inside each block are eight 3in x 3in hollow chambers, providing at minimum 6 inches of air, and 3 layers of plastic. Have The Blocks Gone Through A Fire Test? EverBlock’s have a fire rating of UL 94HB, which means that the blocks have a slow burn rate. The blocks will not flare up when exposed to an open flame. Can I Build A House With EverBlock? If you can think it, you can build it, of course subject to the limitations of block sizes and shape. There are BIG plans with EverBlock in the very near future. In time EverBlock will introduce and expand upon the block system. As of yet, we have not had time to do all of the necessary testing to offer EverBlock as fully rated building material. That said we are happy to help you come up with creative ways to use the EverBlock within your construction project. We have helped guide EverBlock users in building permanent outbuildings with concrete flooring, rebar reinforcement and various roofing types. For smaller smaller structures the blocks can serve as a roof, but are not waterproof. For larger builds we suggest building out the roof as a traditional lumber frame, with corrugated plastic sheets and corrugated connectors. The blocks themselves are waterproof. When building walls and structures, we suggest water and wind-proofing vinyl sheets added to the blocks, which creates waterproof walls.